This is a false post circulating on social media with fake link of SBI. Please find details about it in this article. There are many such links are shared so as to fetch bank details. Please be careful and go through the links shared below that gives you awareness about how to be safe and how to handle these kind of fake messages. “Alarmed over the rise in attempted ‘Vishing’ frauds, SBI Card has alerted customers not to fall prey to fraudulent callers and disclose key information like credit card PIN and passwords. It said that if a customer is suspicious of any call asking him or her to verify such information, please call SBI Card helpline immediately to report the matter. “In case your personal banking details have been compromised with because of a fraudulent SMS, please report it to the bank immediately. 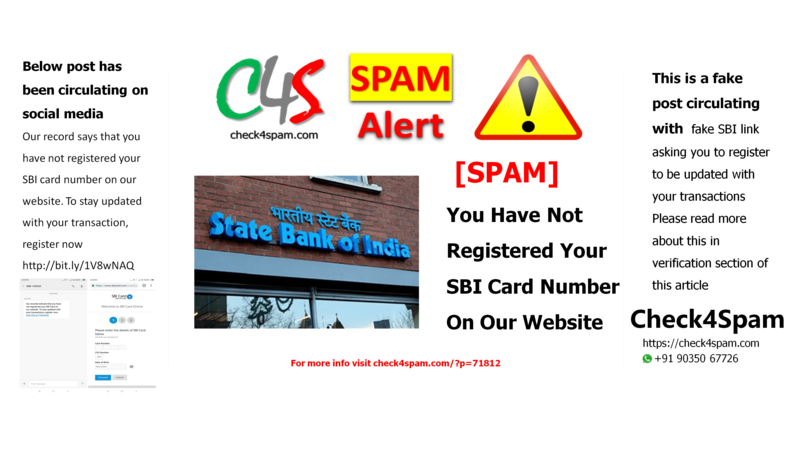 That was the message State Bank of India (SBI) shared on microblogging site Twitter, cautioning the public against circulation of fraudulent SMSes asking the receiver to share their bank details. On receiving any such fraud SMS, individuals should “block the sender”, advised State Bank of India. “If your details have been compromised, report it to SBI immediately,” SBI said. The country’s largest bank, SBI, also urged the customer not to share his or her personal details such as ATM card number, PIN, password, CVV (card verification value) number and card validity period.